The Kerio IMAPInternet Message Access Protocol - One of the two most commonly used Internet standard protocols for e-mail retrieval, the other being POP3. 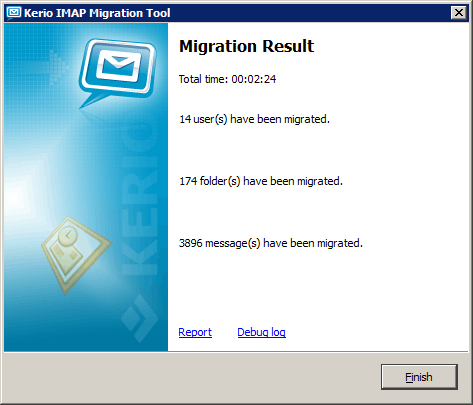 Migration Tool (KIMT) is a free application for migrating user accounts, email messages and folders from your IMAP server to Kerio Connect. The duration of the migration depends on many factors, and may take some time. If possible, perform the migration during light usage hours. 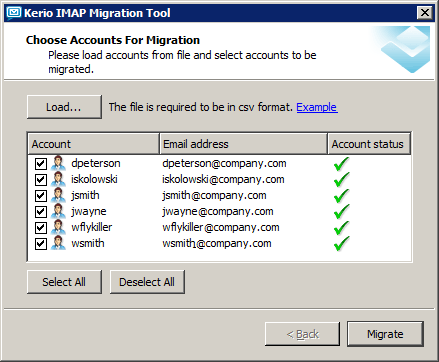 The migration tool does not overwrite or remove the existing data in the destination Kerio Connect mailboxes. You can therefore run the migration tool on active Kerio Connect mailboxes, and the data will be merged. Ensure that data on the source IMPA server does not change during or after the migration process. To prevent this from happening, ensure that users and new email are directed to Kerio Connect server before starting the migration. Before the migration, prepare a CSV file with the list of users and their passwords. This information is crucial for access to the source IMAP server. The CSV file must follow this pattern: user@domain.com;password;Full Name. Public and archive folders cannot be migrated by the standard procedure. If you need to migrate these folders, move them to the mailbox of any user to migrate them as private folders. Install Kerio Connect and run it. Make sure the IMAP service in Kerio Connect runs on port 143. On a machine which can access both Kerio Connect and the source IMAP server, download and install the KIMT tool. We recommend you to make sure the source IMAP server cannot accept new emails. Otherwise migrated data will be inconsistent. The migration requires that both the source IMAP server and Kerio Connect are running. Run the KIMT tool and follow the wizard. Key-in the hostname of the source IMAP server. We recommend to Use SSLSecure Sockets Layer - A protocol that ensures integral and secure communication between networks. connection for security reasons. Key-in the hostname and admin credentials of Kerio Connect. In Choose Accounts For Migration, load the CSV file and select users to migrate. The migration process may be time-consuming. We recommend to migrate data in parts (groups of users). If you interrupt the migration process, the tool only saves the completely migrated data of the user currently being migrated. Before you resume, delete the partially migrated user in Kerio Connect to prevent data duplication. See the Report log section for details. When the migration is finished, click the Report or Debug log links to see the migration result. Once the migration is completed successfully, we recommend you to create new accounts/profiles in users' email clients. This will help them avoid data inconsistency. Every time you start the migration tool, it generates a new log. After completion of each migration, it is recommended to go through this file to make sure that no errors occurred and that all user accounts have been migrated correctly. If users had not been mapped to Kerio Connect before the migration, the Report log includes new user passwords generated by the migration tool. Debug Log Information in this log is useful especially for the developers. If you have any issues during the migration process, this log can help the Kerio technical support to find the solution.